Galerie m is showing recent works by the American artist Peter Wegner (*1963 Sioux Falls, South Dakota, lives and works in Berkeley, California) from July 24 to September 26, 2015. 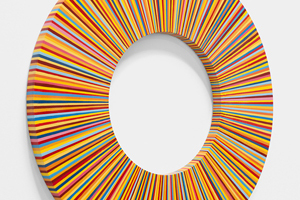 His new series “D65” and “COLOR WHEELS” are conceptual installations exploring the effects of color and light. In both series, Wegner works with picture supports shaped like wheels. In “COLOR WHEELS” pulsating discs of color are created using thin lines, whereas in the series “D65” the artist combines colors by spraying paints into each other, generating intense shifts in hue. The paint is applied to the “COLOR WHEELS” in fine radial lines. In this sense, they are reminiscent of the schematic color wheels once devised by Isaac Newton and other scientists. By contrast, however, the viewer is left ignorant of the fundamental principle governing Wegner’s “COLOR WHEELS.” But the sequence of hues is not random: “It was made by the algorithm of me.” (Peter Wegner). Wegner aims with his arrangements to create impressions arising from the direct juxtaposition of contrasting tones. He is interested here in the relativity of color perception. In each “COLOR WHEEL,” one dominant color is generated by the lines of paint in different shades. The colors that do not belong to the range of the base color serve to lend the surface rhythm, like the blue lines do in “COLOR WHEEL 9,” for example. The multicolored lines complement each other and form a shimmering wheel that pulls the viewer’s gaze around it in a circular motion. 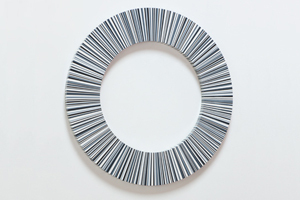 The exhibition’s largest work might thus be construed as something of a riddle: “COLOR WHEEL 5” is namely painted completely in shades of gray. The piece was born of Wegner’s fascination with the scientist John Dalton, who first diagnosed color blindness in 1798. For his series “D65,” Wegner took inspiration from the California sunshine. The radial gradients evoke visions of the glow of the sky at dawn, dusk, and every moment in between. Wegner chose “D65” for the title because it is the abbreviation for “normal light” with a color temperature of around 6500 Kelvin, equivalent to the light on an overcast day. The two shades from which the color spectrum is derived are painted onto the inner and outer edges of the wooden discs. On the surface, Wegner sprays the different shades evenly into and over one another, creating countless nuances of color. 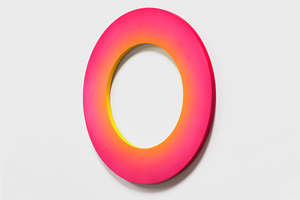 The soft gradient, the lightness of the paint application, in which the weightlessness of the spray mist remains palpable, the void in the center of the wheel, and not least the reflection of color onto the white wall draw the viewer’s perception away from the corporeality of the object and towards a more nebulous impression. “D65” is a tribute to light; intangible, atmospheric, and ephemeral: “Air lit by sun in the arc of a day” (Peter Wegner).